You know, how I maintain my stand on trends? i.e. I don't do trends. Well, that's not entirely accurate. I should have probably said, I don't purchase trends! But if I happen to already own the pieces and/or it suits my style I am happy to indulge in it (trends) every now and then. I have been following this trend (online) for a while. (I have a whole board dedicated to it.) I was extremely intrigued by it's element of comfort and ease. I couldn't wait to try it for myself but of course I was not about to go purchase a pajama set to do so. Until ... I found a set in my wardrobe that felt appropriate and stylish enough to be worn outside the privacy of my bedroom. 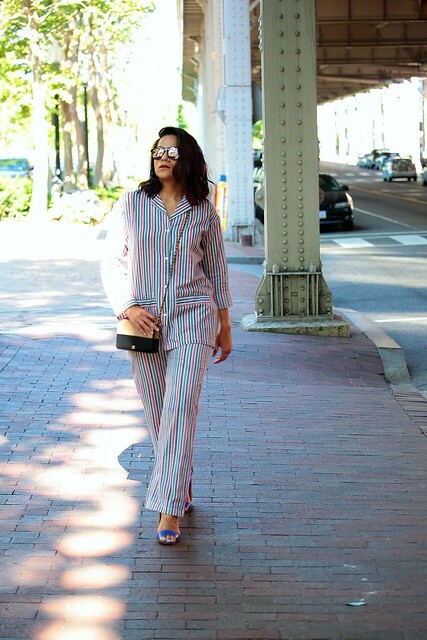 And continuing with my love for cotton from the previous outfit post, this pair of pajamas is also Indian cotton from Anokhi (another one of my favorite Indian stores). That's so funny, I just got back from a pajama dance party at Gaylord National, and this look totally would have worked. What a unique trend! I feel the SAME way about trends, but have to admit I really love this one! Still looking for the perfect set for myself but love this one on you! So nice that you already had a pair of jammies in your closet -- and that they were Indian cotton! I did the pajama set trend as well, but I did have to buy the set as I didn't own any pajamas at all, lol. This look is so daring and I absolutely love that you're taking part in it! You go girl! Hopefully I can take part in this soon! Love this trend and love the combination of the stripes!! I hadn't heard about this trend until right now! You're rockin' those striped PJs; looks great! I love love that you don't purchase trends, Tanvii. Your pajama dressing is a cool, modern, understated and fun way to wear a colorful pantsuit. You pull it off so well! I love this look!! It is so unique, totally lets you express your own personality! Those shoes are killer! I love a good block heel and what a unique trend! This is styled to perfection! I want to live in this outfit. My wife said no i bought it anyway!